Aquí os dejamos la entrevista entera. SofN: Good morning, first of all, on behalf of our magazine Science of Noise , we would like to congratule you for your las work The Free Life (2018)… such an amazing album! Maybe some of our readers doesn’t know about Turbowolf, could you put in context the band and its musical proposal ? We’re a four-piece band from Bristol UK, formed around 2006. We have released 3 album. Our vision from the start was and still is to strive to create something new in the “heavy music” world. SofN: You formed the band in 2006, and after three albums and more than ten years together, in 2018 you published a new album called The Free Life , an intelligent work, very well-prepared and a bit different from the other works Do we hear a new-found compositional maturity in it or is it simply a natural evolution? With The Free Life, we aimed to make something that fit in-between our first and second albums in terms both of song style and production. Generally though, our aim is always to write the best songs we can and not to worry about what’s come before or what might come after. I don’t compare it, I just see it as a body of work that stands on it’s own. Now it’s finished, I don’t think about it, I just let it go and move on. SofN: This Is your first work with SO Recordings and a bit different work in relation to Two Hands. How has SO influenced the final result of The Free Life? Not at all actually. The album was completely finished by the time SO came on-board, but they’ve been great to work with ever since. SofN: How has been the process of creating this work? Andy (guitar) writes the music and I write the vocals, we then arrange it together. We then did about two months of pre-production with Blake (drums) to iron out tempos and finalise drum patterns. After that, we recorded drums in 4 days at Invada Studios in Bristol, then Andy and I spent another 4 months recording all the other parts at home. We then mixed it with Tom Dalgety at his studio over about 3 weeks. It was then mastered by John Davis at Metropolis in London. Album artwork was created by Andy as always. The main themes revolve around free will and what communications we take part in, consciously and sub-consciously. SofN: With the perspective of time, what decisions are you most proud of, which ones do you think you should have taken before and what do you think was wrong? I try not to dwell in the past. We just tried to do the best at that point in time and I’m satisfied that we did that. We have had a few member changes over the years but mainly we just try to be nice to each other, nothing too complex! SofN: How is the current scene of hard rock / stoner rock in the UK and in your area in particular? I’m not entirely sure as I don’t have my finger on the pulse really, but there’s always good turnouts for rock shows in Bristol. SofN: Are you able to select the five tracks that best define your career until today? I’ll give it a go: “Ancient Snake”, “Let’s Die”, “Rabbits Foot”, “Solid Gold”, “The Free Life”. 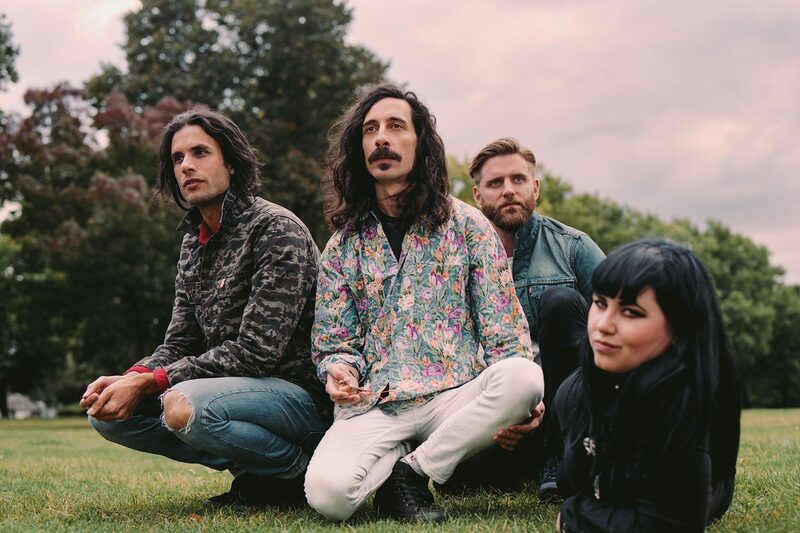 SofN: Our magazine team really enjoy the “Tops”, can you quote the top five albums that left a mark on Turbowolf sound ? SofN: Turbowolf played at Azkena Rock in 2014, now, you will come to Madrid for first time in few weeks in one of the most wonderful Spanish festivals, the KristonFest, but I live in Barcelona and hasn’t been able to enjoy Turbowolf here. What do you remember about Azkena and when we will can see Turbowolf in Barcelona? I remember we went on stage after The Scorpions and it was late and there were a few thousand people there and people had a good time. SofN: What are we to expect from your show in KristonFest ? The right notes played in the wrong order. SofN: Thank you very much for everything. We look forward to welcome you in our city very soon. From Science of Noise, we wish you all the best and we would like to congratule the whole band for the great job done since now. Thanks for your time!